Sten Rudstrom – Ta(l)king Your Head Off // Dismantling the Left-Brain Conspiracy and Entering the Explosive, Colourful Absurdity of Experiential Speech! Once you discover that language is a visceral experience, that words are not purely mental constructs but actual body experiences, your improvisations crank up. You are no longer limited by what you think you should say or believe should be said. You are being led by the experience. Each word, each vowel and consonant, on the tongue, in the mouth, teeth, air leads the improvisation. Awareness of the sensations becomes the driving force for language not thought. Thought and imagination are assistants on the path of language, not the directors. Ta(l)king Your Head Off is intended for all performers — dancers who want to feel their text in the flesh, actors who want to feel their flesh in the text, those who find joy in the use of language, as well as, those who hope to find that joy. 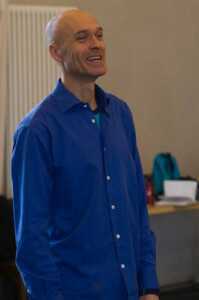 Sten Rudstrøm has worked for over 25 years with Ruth Zaporah, the developer of the improvisational performance training process Action Theater™. Sten’s workshops and performances have garnered wide respect and critical acclaim throughout the USA and Europe. His high-energy trainings articulate and promote the development of stronger performance skills. He has a five year old son who is teaching him how to truly improvise.